Universities are being urged to put resources into monitoring online threats in light of a spate of incidents at North American institutions that intensified after the fatal mass shooting at an Oregon college in October. 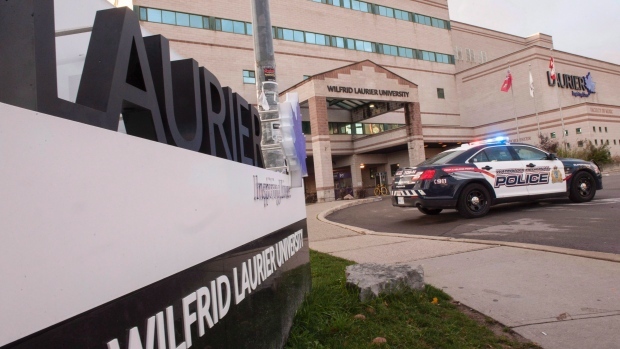 Threats against several Canadian universities have been posted on blogs and online forums in recent months, including one case at Wilfrid Laurier University that triggered an hours-long lockdown of the Waterloo, Ont., campus just a couple of weeks after the carnage in Oregon. The University of Toronto, McMaster University in Hamilton and Lakehead University in Thunder Bay, Ont., have also been targeted. Administrators at several universities across Canada say online threats are a growing concern, and stress campus security and police have been working to keep up with emerging risks and harness technology to keep students, faculty and staff safe in case of emergencies. But William Taylor, president of the International Association of Campus Law Enforcement Administrators, said it's an uphill battle, particularly as social media grows more pervasive. "There's always new technologies and new things coming online and frankly, law enforcement and institutions are always a little bit behind that in learning how to deal with it," he said. And while copycat hoaxes largely account for the surge in online threats, it remains critical to quickly assess the credibility of each message, he said. Officials at the University of British Columbia, the University of Calgary, McGill University, and the University of Toronto all say they take every threat seriously and continuously review their security protocols. Each school has a system in place to get the word out during a crisis, often a mix of opt-in text alerts, email warnings, university-specific apps and websites, electronic signs and Twitter posts. And most have tasked a few employees, typically in the public affairs department, with keeping an eye out for online threats and flagging them for police when spotted. Taylor said that's no longer a realistic approach. "If you have somebody just sitting there watching it, it's not a highly efficient system. They're not there 24 hours a day and they're not data mining broadly; it's usually very close to the campus... and it's usually specifically those things where it's addressed to the college," he said. Many institutions south of the border now hire data-mining services to comb the Internet for concerning posts, which he said is much more effective -- but also more expensive. "There is a cost, there is, and it's unfortunate but you have to put resources toward things in order to address them," he said. At Dalhousie University in Halifax, administrators rely on a combination of outside data mining and internal social media engagement. "None of us could pay attention to all the -- you know, Facebook, and Twitter and LinkedIn and Yik Yak and all these things, but there are aggregator services that will look for any mention of your university...so that when those are mentioned in any social networks you get forwarded a response," said Dwight Fischer, the university's chief information officer. Social media also plays a role in responding to online threats and combating misinformation, university officials said. But knowing how much information to release can be a challenge. The University of Toronto faced criticism in September after it chose not to disclose details of a threat that was posted on a local blog. Images of the post quickly circulated online and the union representing teaching assistants at the university said the threat targeted the sociology and women's studies programs. The university made the decision after consulting police, which deemed the risk low, said spokeswoman Althea Blackburn-Evans. Security was nonetheless beefed up on all campuses, she said. The issue of online threats is on the radar of the Ontario Association of College and University Security Administrators, to which the university belongs, Blackburn-Evans said. "In the new year, this group will be coordinating efforts to address online threats and best practices of response and action," she said in an email. The recent incidents likely flow from a similar trend in the U.S, said Taylor of the International Association of Campus Law Enforcement Administrators. While cyber crime has been a growing concern for years, there has been an "onslaught" of online threats levelled at American universities since the Oct. 1 shooting that resulted in 10 deaths at Umpqua Community College in Oregon, and Canadian universities aren't immune to the phenomenon, he said. "It's different than we've had any other year before," Taylor said. A 4chan post that preceded the Oregon shooting read: "Don't go to school if you are in the northwest. happening thread will be posted tomorrow morning." A similar message was posted on the forum weeks later warning people not to go to Wilfrid Laurier's science building. A 22-year-old man in London, England, has been charged with malicious communication and released on bail.